After high school Allison went to the University of Kansas on a football scholarship- he was a fullback. He also played baseball for Kansas. Baseball was his best sport and he had offers from a number of big league teams. He chose the Washington Senators because he figured the Senators would be easier to make than say the Yankees- another team that was interested in him. Allison came up for eleven games in 1958 and made the team in 1959 out of spring training and went on to become the 1959 American League Rookie of the Year- and made the All-Star team. His numbers 30 home runs 85 RBI .261 average. He led the American League with 9 triples. Although a big man Allison was an aggressive base runner. The heart of Allison’s career was from his rookie season in 1959 to 1965. With the Senators- Twins he teamed up with Harmon Killebrew to form one of the best one-two power combinations in baseball. Also- I can’t imagine wanting to get into a fight with the Twins- with Allison and Killebrew two of the strongest men to ever play the game. Bob Allison hit and threw right handed and during his career mostly would play in right field where he had one of the best throwing arms in baseball. Allison made the all-star team three times, his rookie year in 1959 and in 1963 and 1964. His best single season would have been 1963 at age 28 when he hit 35 home runs knocked in 91 runs and hit .271. He had the American League’s best WAR in 1963. 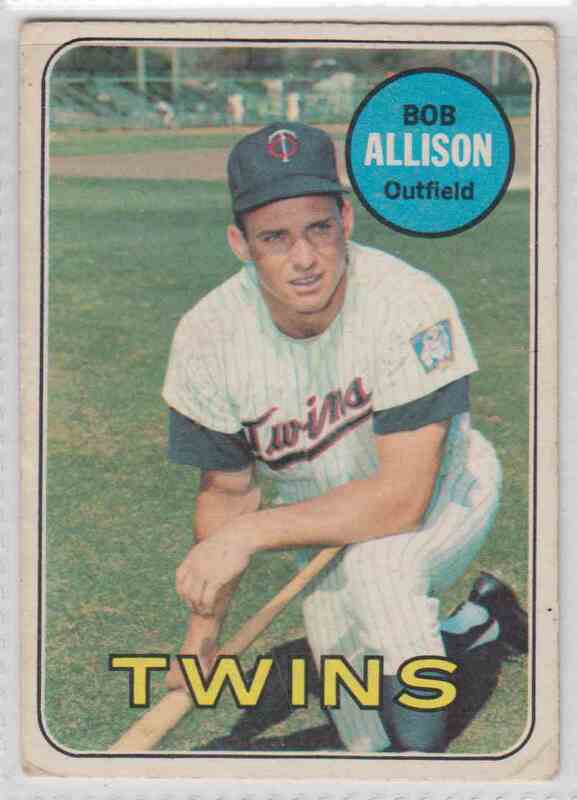 The Twins made the World Series in 1964 but Bob Allison had a poor series going 2-16 with a home run and 2 RBI. In 1966 he would injure his knee and that marked the start of his decline. He would return in 1967 and 1968 with decent seasons before becoming a part-time player in 1969 and 1970- retiring at the age of 35. The career numbers for Bob Allison- 256 home runs, 796 runs batted in, a career batting average of .255 and a .568 On base percentage, he also stole 84 bases in his career. Injuries hampered a fine career- he had a number of wrist/ hand injuries during his career and the bad knees towards the end. He was a line-drive hitter. They called Killebrew and Allison- “Mr. Upstairs” and “Mr. Downstairs”- The Killer hit home runs that soared through the air while Allison swung down on the ball and didn’t consider himself a home run hitter- he hit bullets. Allison became a fan favorite when the Senators moved to Minnesota to become the Twins. He wasn’t a player who sought the spot-light but a ballplayer just came and played hard every day. Maybe because of his quiet nature- he’s been kind of a forgotten star. In 1987 while playing in an Old Timers Day game- Allison noticed he was struggling just running and trying to catch the baseball. After two years of going to doctors he was finally diagnosed with a rare disease Ataxia. Ataxia is a degenerative neurological disease much like ALS. Allison died at the age of 60 after fighting the disease for eight years. I can’t believe I never heard of him…those were really good numbers in the sixties. He played in the shadow of Killebrew with the Senators/Twins. Doesn’t sound as if he was a fella who cared much for the spotlight on him.